(Nanowerk Spotlight) Therapeutic nucleic acids (TNAs) are increasingly being considered for the treatment of a wide variety of disorders such as cancer, metabolic disorders, viral infections, cardiovascular and inflammatory diseases. However, over the past decade only three TNA formulations have resulted in successful clinical translation. The primary barrier to clinical use of TNAs has been their rapid recognition by the body's immune system, often resulting in uncontrollable severe inflammatory responses. However, attempts to deliver TNAs using nanocarriers (e.g., liposomes and polyplexes) have also been unsuccessful as demonstrated by several recent examples of biotechnology companies dropping nanoparticle formulated TNAs after experiencing toxicity and even patient death in clinical trials. "Programmable nucleic acid nanoparticle (NANP) technology is a relatively new field that has already given rise to a host of self-assembling nucleic acid nanoparticles that are increasingly viewed as promising biological materials for medical applications," Kirill A. Afonin, an Assistant Professor in the Department of Chemistry at the University of North Carolina at Charlotte, tells Nanowerk. "Programmable self-assembling NANPs are amenable to chemical modifications, control over functionalization, and consistent batch-to-batch formulation." "The Drug Information Association (DIA) in close collaboration with the U.S. FDA and industry formed the Oligonucleotide Safety Working Group, which spent several years before releasing a justification that therapeutic nucleic acids deserve to be a separate category of drug products because they resemble small molecules and biologics, and yet have their own properties," says Marina A. Dobrovolskaia from the Frederick National Laboratory for Cancer Research sponsored by the National Cancer Institute, Nanotechnology Characterization Lab. However, clinical translation of these materials is still in its infancy – no NANPs have reached clinical trials yet. The reason for this is that the immunotoxicity and immunomodulatory effects of NANPs are mostly unknown and must be defined to permit successful translation of this technology into the clinic. "Despite early attempts by us and others to link NANPs physicochemical properties to their immune recognition, the results of these studies are either incomplete or inconclusive," says Afonin. "Immunostimulation – cytokines and chemokines induction, lymphocyte proliferation and upregulation of surface markers – is an essential step before anyone attempts to understand the immunogenicity." Since no such study has ever been done for NANPs, a team led by Afonin and Dobrovolskaia conducted the first detailed and systematic study that involved 25 most representative NANPs, originally designed by different groups, screened for the induction of 29 different cytokines. The study, reported in Nano Letters ("Structure and Composition Define Immunorecognition of Nucleic Acid Nanoparticles"), was done in human blood collected from more than 100 different donors. – Traditional TNAs (depending on sequence, backbone, and modifications) per se stimulate activation of the immune cells. Unlike these TNAs, NANPs require delivery into the cells, otherwise they are invisible to the immune cells. This finding has never been described before. – Traditional TNAs stimulate type I interferon (IFN) response. The researchers experimentally confirmed that type I IFN can be used as a biomarker of NANPs' immune recognition. In addition, they also showed that NANPs induce type III IFN, which has not been investigated in detail by scientists working with traditional TNAs. 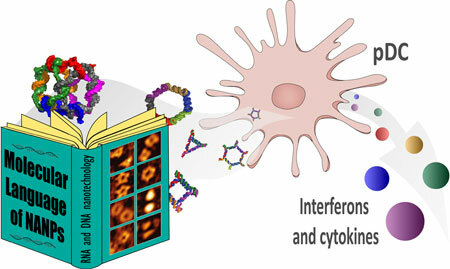 Both experimental confirmations of type I IFN induction by NANPs and role of type III IFN are novel findings, which have not been published before in the context of NANPs physicochemical properties. –	Traditional TNAs are recognized by various immune cells, however plasmacytoid dendritic cells (pDCs) are the primary producers of type I IFN. Here, the team experimentally confirmed that pDCs are also responsible for both type I and type III IFN induction by NANPs. This study has never been done before. – It has been shown before that traditional TNAs are recognized by endosomal Toll-Like Receptors (TLR). It has also been shown that TLR specificity to traditional nucleic acids is as follows: TLR3 – dsRNA, TLR7 and TLR8 – ssRNA and TLR9 – DNA. Here for for first time, the team confirmed that NANPs are taken up by endolysosomal pathway and induce IFN response through TLRs. However, the study demonstrated that TLR7 (not TLR3) is the receptor involved in the recognition of RNA cubes. It also showed that TLR9 is not the receptor recognizing DNA cubes. Overall, these findings highlight the key parameters that inform the way NANPs interact with the immune system. These new insights improve the current understanding of NANPs' immunostimulatory properties and pave the way to the development of a new auxiliary molecular language that can be expressed through the script of rationally designed NANPs. Such communication with the immune system will become instrumental, for example, in either achieving desirable activation of the immune cells that are beneficial for vaccines and cancer immunotherapies or reducing undesirable immunostimulation that commonly limits the translation of systemically delivered traditional nucleic-acid-based therapies. "We hope that our study helps facilitate bridging the already narrowing gap between basic research on NANPs and advanced pharmaceuticals containing these novel materials," Afonin concludes. "This paves the way to the rational design and production of NANPs not only based on their functionality but also based on their immunotoxicity, thus allowing to create efficient delivery platforms with non-immunogenic NANPs and novel adjuvants and immunomodulators with others."